As the days of my self-imposed "hiatus" from online courses come to a close, I had been searching for an event that might "jump-start" the passion I had when I took up this initiative just 18 months ago. Being a member of good standing in the Society of Professional Journalists (in a student capacity), I was already receiving email notifications about their annual Excellence in Journalism conference scheduled for late August in Anaheim, California. Given several months notice, I would be able to set aside the shekels required to get me there plus a few days for sightseeing in the greater Los Angeles area to boot. I was all ready to make the arrangements when I received another mailing in late March about an SPJ event that was happening practically in my backyard. 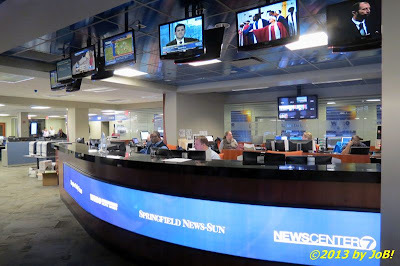 SPJ’s Spring Conferences are day-long professional development meetings bringing area journalists, students and journalism educators together in one place to hear from industry experts on topics ranging from improving writing to leveraging technology in today’s new media climate. 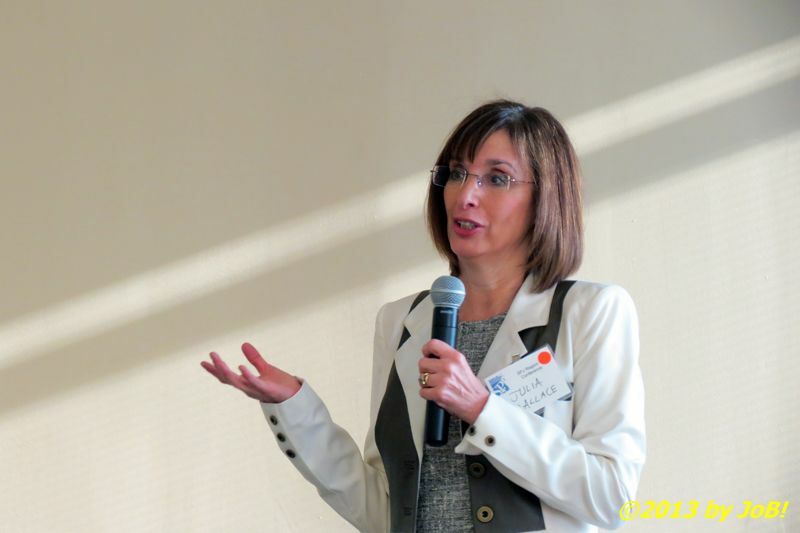 Networking opportunities at the conferences allow participants to build relationships that can lead to the sharing of the best practices in newsrooms. Enhance yourself and your journalism career by attending a Spring Conference in your area. Hmmmm...professional development...industry experts...networking opportunities...how could I NOT show up? This is EXACTLY what I was looking for! Although the event was less than two weeks away, I filled out the online registration form and was pleased to receive an email confirming my attendance. 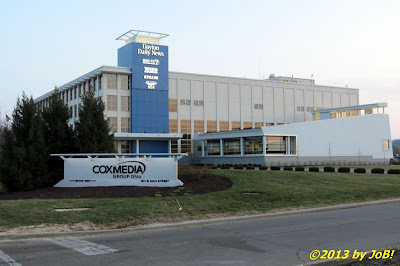 According to the posted schedule, there would be a cocktail reception at the Cox Media Group (CMG) Ohio Media Center in downtown Dayton on the evening of April 5th with the actual conference being held the following day at the University of Dayton's River Campus. In addition to the reception, tours of the CMG facility (which houses all of The Dayton Daily News' non-printing operations, the WHIO-TV studios, and three separate radio station studios) were being offered on a limited basis. Another quick submission done and quick approval received so I was going to take advantage of everything this conference had to offer. After finishing up my regular work week and making a quick stop at home to pick up my gear, I started on my way into Dayton. I live to the east of the city so I had a pre-planned direct route in mind to get me to the media center; unfortunately, I did not factor rush-hour traffic and construction delays into that scheduling equation. When I approached the intersection of I-675 and westbound US Route 35, I could see that vehicles heading in the direction that I wanted to go were at a standstill and a long line of cars was backed up in the approach ramp. I made an immediate change in route and continued along the interstate for another eight miles until I exited for Ohio Route 48 (I sacrificed distance for time). Now off the highway, I had to contend with residential and commercial traffic for the remainder of my drive towards downtown Dayton. Arriving later than anticipated (but just a few minutes past my scheduled time), I parked in the visitor lot and had a security officer direct me downstairs to the registration area outside the cafeteria. It was then that I found out that my tour had already left but, thankfully, I could go in the next--and final--group of the day. I took that opportunity to look through my "goody bag" of conference items and do some networking with other attendees. 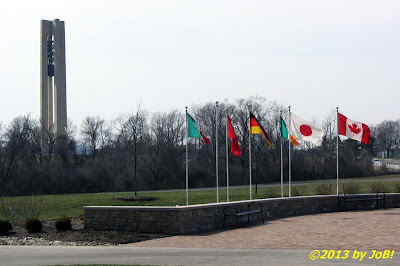 When the previous tour group returned, it was our turn to head out to see the CMG Ohio spaces. In the spirit of full disclosure, I must admit that this was my second time through (I received a personal tour when I visited a former DDN employee back in the fall of 2011) but it was nice to get a chance to see it all again (and to take pictures--I wasn't allowed to during that previous one). After seeing the fitness center on the ground floor, we took the elevator up to the main level where all of the operations areas are located. 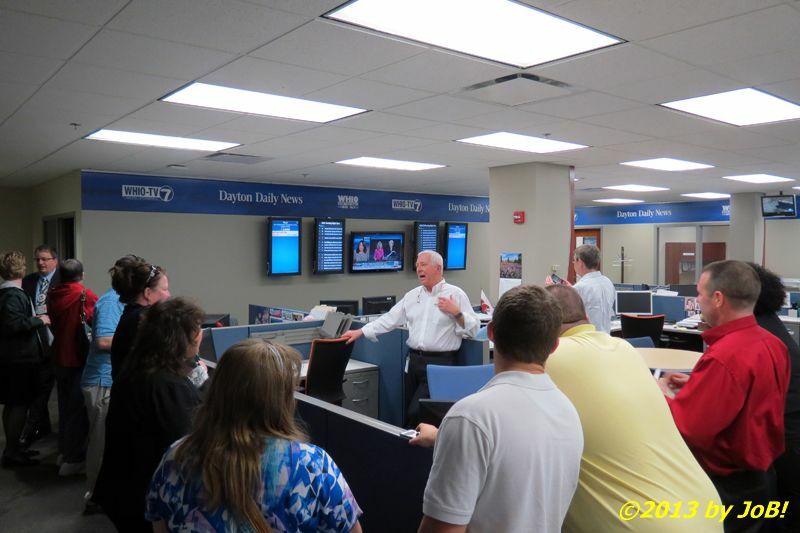 Pausing in the lobby to watch a short video overview of CMG Ohio operations, we entered the spaces primarily occupied by members of The Dayton Daily News. Being so late in the day (as well as a Friday), not many employees were seen at their desks (I did recognize a few of those "stragglers" from my reporting assignments during last year's presidential campaign but I did not get a chance to say hello). 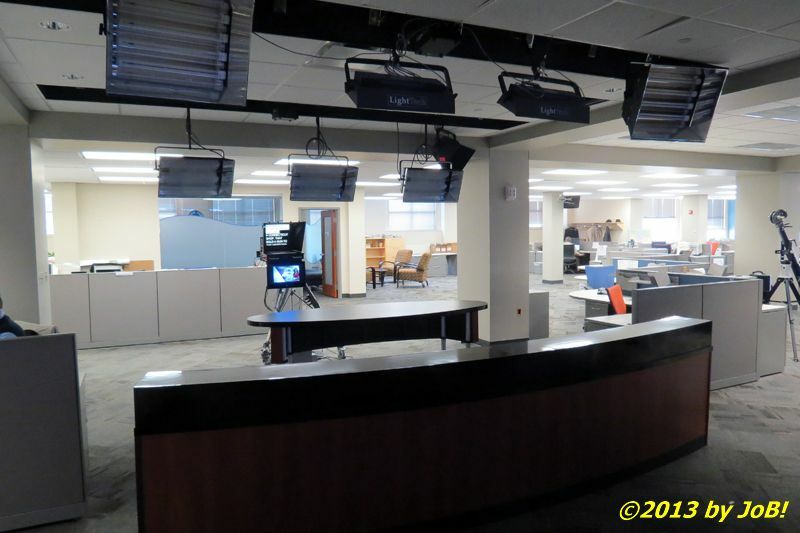 Most of the newsroom's focus was being placed on the television news broadcast that was happening at the same time (weekday telecasts run from 5 to 6:30PM). It was very obvious to see the benefits of consolidating all of these operations under one roof. 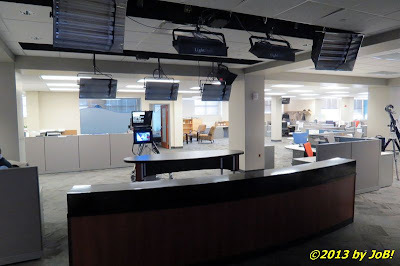 In the center of the large partition-less room was a "breaking news" desk used by all of the media outlets. 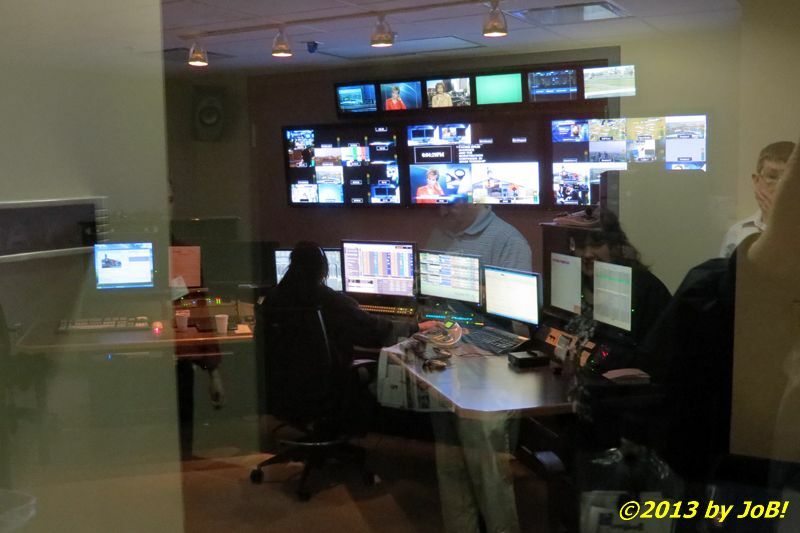 This 24/7 element monitors a variety of television, online and "traditional" sources of information (such as police scanners) to keep abreast of what is happening in the local area, state, country and internationally. 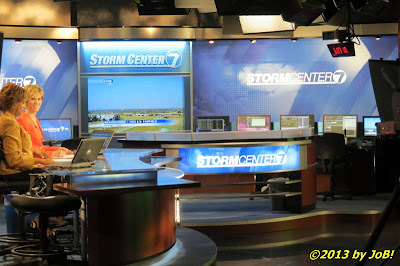 There is also a satellite television studio (consisting of a table, a camera, studio lighting and a teleprompter) that allows a reporter or anchor to immediately break into on-air programming with important information directly from the newsroom instead of making the short walk over to the main studio. After transiting our way out through the television production area, our group got to take that short walk ourselves (about 100 feet or so) and we next staged ourselves outside the large soundproof doors to get an overview about the television studio. Entering through another smaller door further down the hallway, you were immediately enveloped in the bright quiet coolness. To compensate for the heat cast off by the lighting, the ambient temperature was much cooler than in other areas of the building. 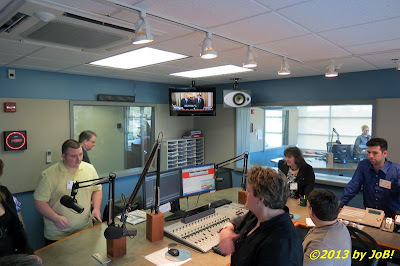 We lined up along a back wall but had a direct view of the news set and of the on-air personalities in the middle of their newscast. The two News Center 7 anchors, Cheryl McHenry and Letitia Perry, were seated at their raised desk with laptops just outside the camera shot (meteorologist Erica Collura was busy preparing her upcoming weather segment and was darting between the "Storm Center" area and offstage data displays). The anchors welcomed our group during a commercial break and went right back to the telecast when cued by the in-studio producer. 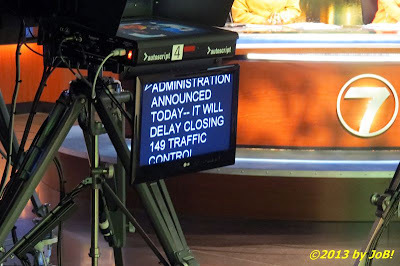 As someone who remembers seeing movies and television shows that showed sometimes dozens of people inside a studio (to include camera personnel, cue cards, and other support functions), I was amazed to see just one in-studio producer who sat just a few feet away from the anchor desk. From that highly automated position, he was able to monitor video feeds, assign camera shots, scroll script out to the various teleprompters and probably several other tasks that I cannot think of right now. 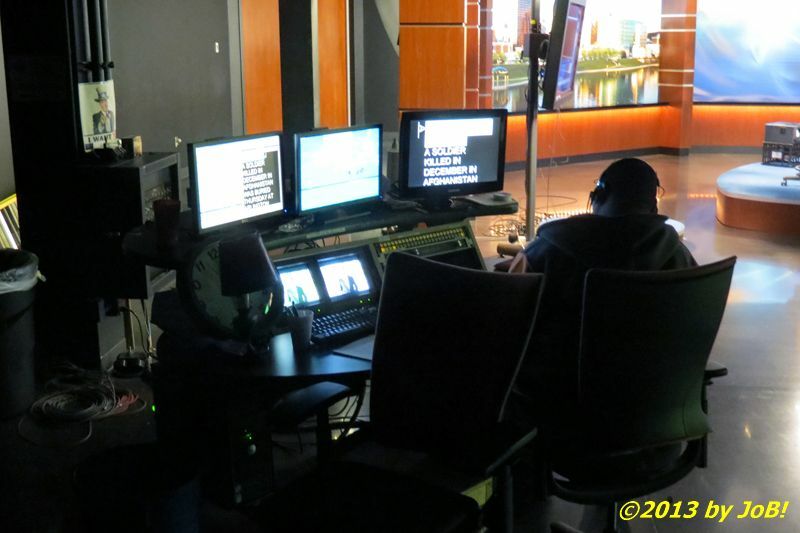 With modern technology (and a veteran anchor), a local newscast could be done with only two on-air personalities (news/sports for one and weather for the other) and that technical expert. 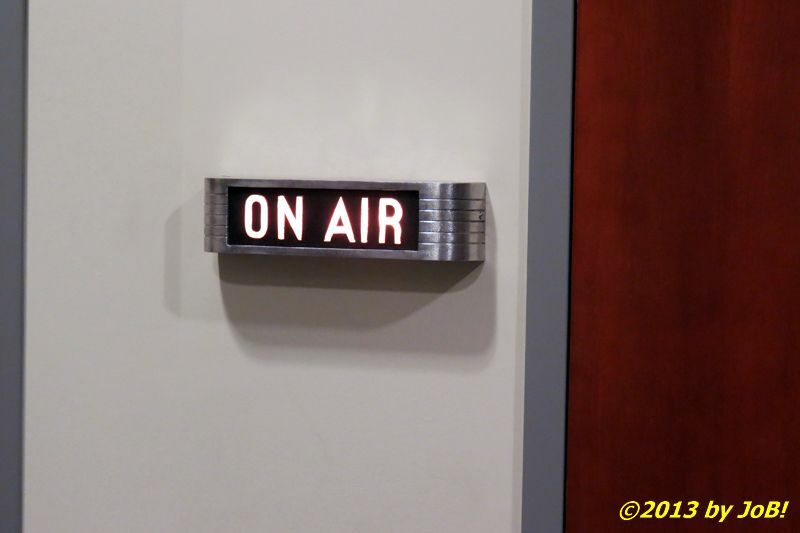 While this is a low number, one must remember that there are personnel in the station's master control room that are performing their daily technical "miracles" behind the scenes to ensure everything runs smoothly throughout the entire operation. 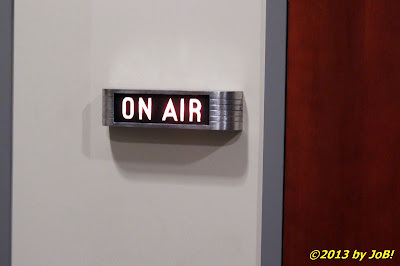 The in-studio producer brought the total number of people inside the room to--four! We left the studio before the weather segment (it's a good thing, too, because one of my vantage points was very close to where she would have done her "green screening" of the various weather-related graphics we have become accustomed to over the years) and made our way out into a hall between the television and radio areas. 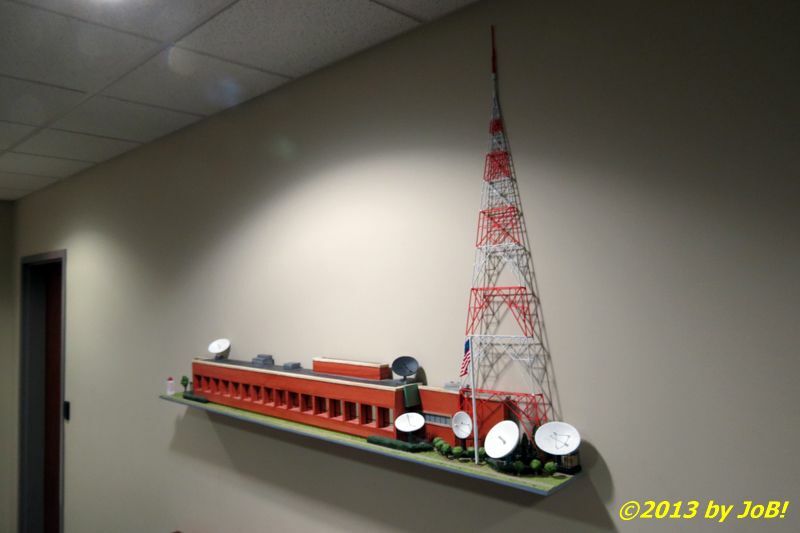 On one of the walls hung a model of the old WHIO radio and television studios on Wilmington Avenue that were opened back in 1949 and served as both stations' home for over 60 years (their operations moved to the CMG Ohio facility in late 2010 and the facility was demolished last December). Although lacking a plaque, those who work there understand that it serves as a very fitting homage to their organization's storied history in the Dayton region. 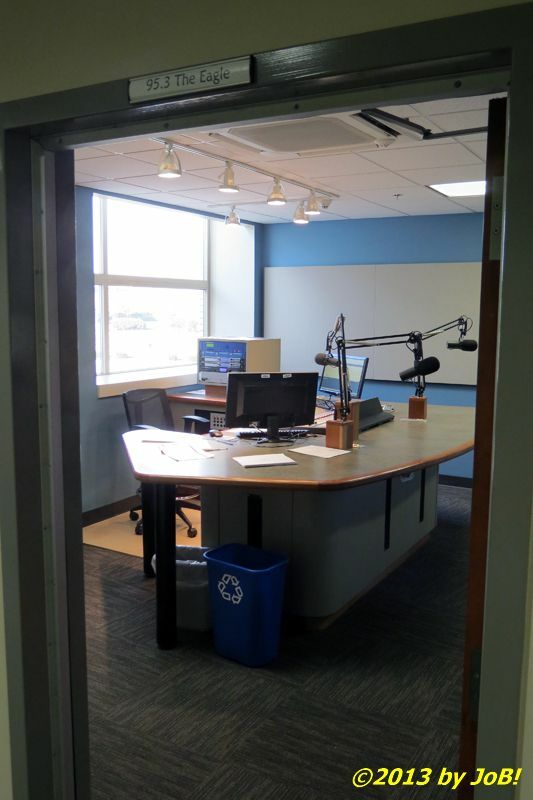 If the print office spaces were sparsely populated, the radio studios were virtually desolate. Due to increased automation, many of the functions of running three separate stations can be completed by just a few people. 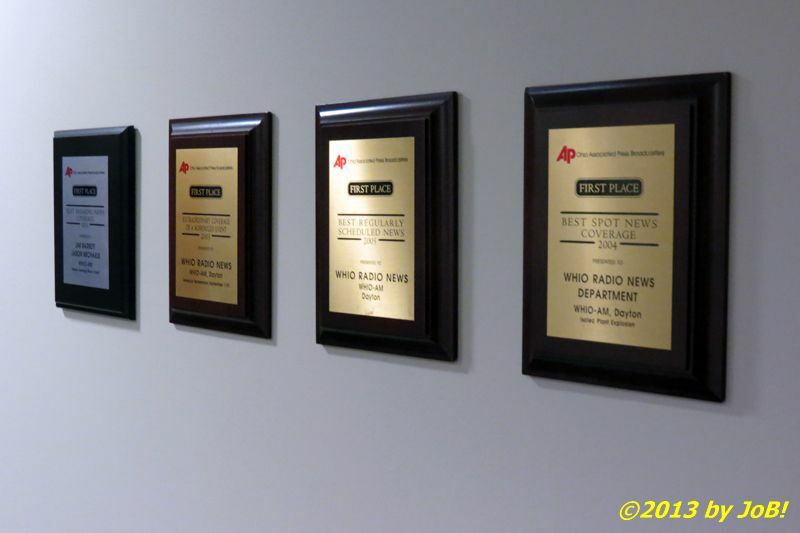 With the exception of local news/weather/traffic cut-ins at the top and bottom of each hour and morning news programming from 5-9AM weekdays (and University of Dayton Flyers football and basketball games during those respective seasons), the majority of WHIO's Monday-Friday broadcast day airs syndicated talk (Herman Cain, Rush Limbaugh, Sean Hannity, Andy Dean), financial advice (Clark Howard) and eccentric (Coast to Coast with George Noory) shows. WHKO (K99.1FM) is a country music outlet and WZLR ("The Eagle") currently plays rock hits from the 1980s so a single "disc jockey" (either in-studio or from a remote location) is the norm (although both stations do produce their own local morning shows). The radio studios were the final stop of the tour and our guide returned us to the cafeteria area to partake in the cocktail reception. 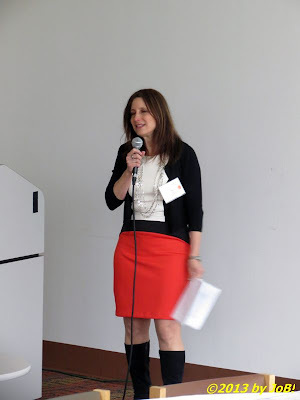 Julia Wallace, CMG Ohio market vice president, greeted the attendees and primed us for the next day's "super session" concerning the state of the newspaper industry in Ohio. 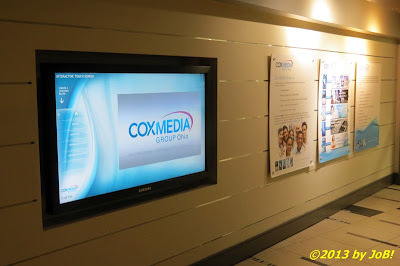 Other Cox Media personnel also provided greetings and mingled with the attendees during this social session. I did not have a designated driver so I had to opt out of my two free drinks and I did not win any of the gift bags offered as door prizes but the food and conversation were good and got me psyched for what awaited the following day. 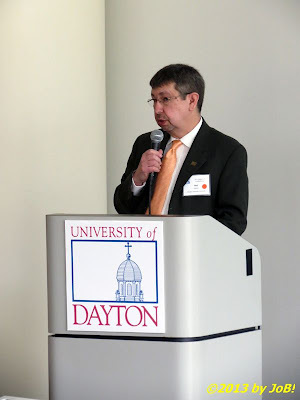 The traffic situation on Saturday morning was a welcome relief to what I experienced the previous afternoon and I got to the University of Dayton's River Campus without incident. I met up with a few people I chatted with at the reception and we announced our plans for which sessions that we would be attending. Except for the "super" one, attendees had to decide between several different offerings that were occurring at the same time. For example, the schedule showed three 9-10:30AM sessions about topic ranging from obtaining an internship to photography to journalistic ethics. Since I already took a University of Massachusetts course on ethics and I am still not as proficient as I would like to be with my camera, I opted for the "On the Hunt" session. As a "seasoned" student, I felt a little out of place among the mostly "20-somethings" who were looking for their first opportunities to find employment or for-credit work experience. I am also at a disadvantage because I am about 800 miles away from my campus and have no physical linkage to the Amherst community. To compound those constraints, I would also be looking at part-time opportunities because I'm not quite ready to transition from a my current non-journalism position. 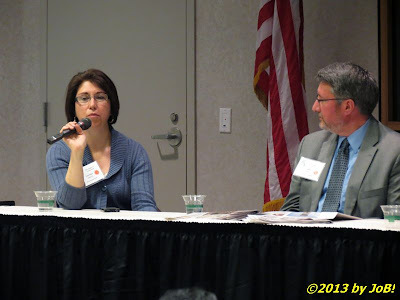 The moderator and another panelist understood my situation and offered me encouragement to pursue leads here in the local area. At the conclusion of those smaller meetings, all attendees were asked to meet for a "super session" in one of the school's conference rooms. 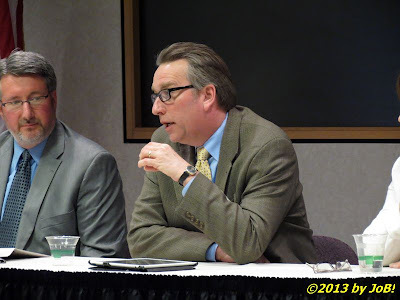 After introductory remarks by the Region 4 director Patti Newberry, a panel discussion, entitled "New Newspapering", was conducted to review the measures that four of Ohio's largest newspapers have taken due to the growing challenges and negative trends seen currently in print journalism. 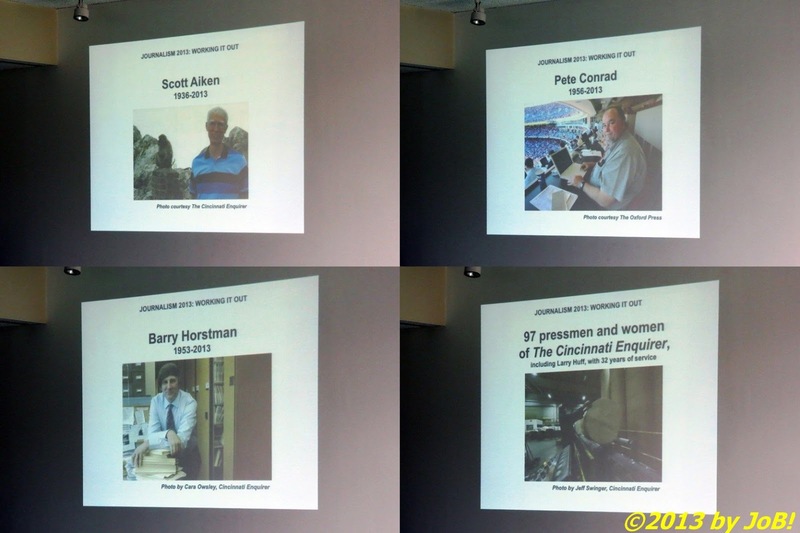 Editors from The Cincinnati Enquirer, The (Cleveland) Plain Dealer, The Columbus Dispatch and The Dayton Daily News represented their dailies. Patti Newberry, Region 4 Director for the Society of Professional Journalists, makes remarks prior to the "super session" on "New Newspapering"
Tom Fladung, managing editor of the Cleveland newspaper (largest circulation in the state and 20th in the nation) provided his organization's rationale for their recent decision to cut back home delivery service to three days a week in conjunction with the creation of an "e-edition" version of the paper (although printed copies will be available seven days a week for newsstand sales) and increase their online presence through the creation of the Northeast Ohio Media Group. At one point waving his iPad around for emphasis, Fladung stated that the future of print journalism sits squarely online and that a lot of attention needs to be placed on making newsreading an enjoyable experience on electronic devices. Alan Miller, the Dispatch's managing editor, commented on the feedback his organization has received due to the "shrinking" and redesign of its printed paper that happened back in January (I blogged about it here). 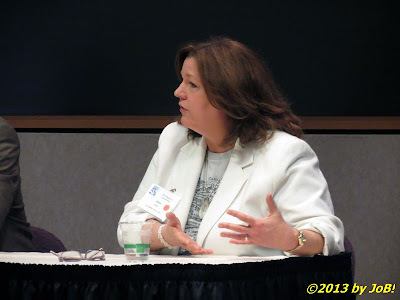 Following his example, Carolyn Washburn, editor and vice president of The Cincinnati Enquirer, provided some back story on a similar reduction in the size of their newspaper (and, as I would find out later in the day, a partnership with the Dispatch for printing operations) as well as a renewed focus on local stories. 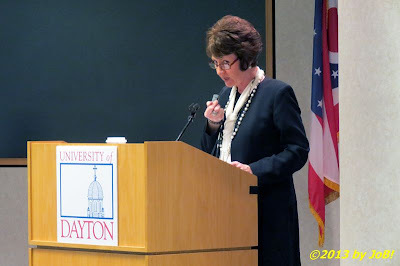 Rounding out the introductory comments was Jana Collier, editor of The Dayton Daily News (and sometimes target of complaints that I personally have with my local daily). Coincidentally, her organization has highlighted the recent changes at the copanelists' publications in her own paper's list of promises made to its Dayton readership. She also hinted about an upcoming premium website available exclusively to subscribers that would not be a "pay wall" but be an area that featured more in-depth and focused content for the region (it debuted the week following the conference). 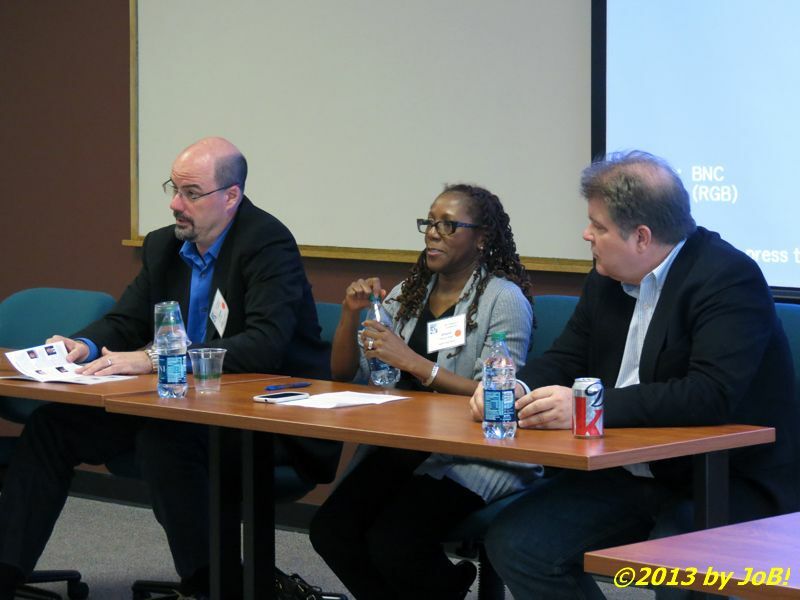 During the question-and-answer period, moderated by Mizell Stewart, vice president of content, E.W. 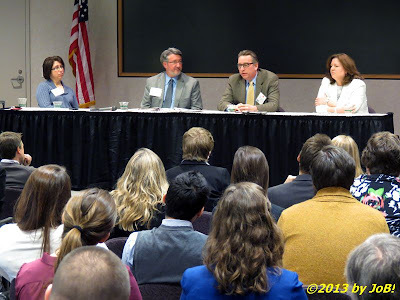 Scripps Co., the editors provided their unique perspectives and shared their experiences in their current and former positions on issues facing up-and-coming journalists. This rule is probably universal throughout the professional world but it would not be a conference if there wasn't a luncheon or dinner held in conjunction with the gathering (there was a formal meeting to go over official SPJ business at 8AM but, as an at-large member, I decided to skip it). While the eats at CMG Ohio the previous evening were much appreciated, the main event for the weekend would be the lunch and Mark of Excellence presentations that were held after the "super session" in the campus' main cafeteria. After the attendees returned to their seats from the food tables, Neal Ralston, the SPJ Vice President of Campus Chapter Affairs, updated the gathering on the latest news from the national office. WCPO-TV's investigative reporter (and former SPJ president) Hagit Limor presented the tribute segment for three journalists and for 97 former print employees at The Cincinnati Enquirer. Scott Aiken, Pete Conrad and Barry Horstman, all with ties to journalism in "The Queen City", died earlier this year and the pressmen and women lost their jobs March 10, 2013 when the paper moved those operations to Columbus--the same plant that prints The Dispatch--in conjunction with its transition to a more compact size. The remainder of the luncheon was devoted to recognizing college students and their educational institutions for the region's annual Mark of Excellence competition in print, art/graphics, radio, television and online journalism. These awards are presented in all 12 of the SPJ regions and the winners go on to compete at the national level. Over 100 awards were given out and I was introduced to a new way of applause--a single clap for each recipient--in an effort to reduce the overall time for the process and keep us on schedule. The afternoon sessions began a little after 1:30PM and one of the four offerings at that time was the one that I really wanted to sit in on. "After the War", a discussion about military news coverage in the waning days of the wars in Iraq and Afghanistan, would feature two local reporters that I read quite often. 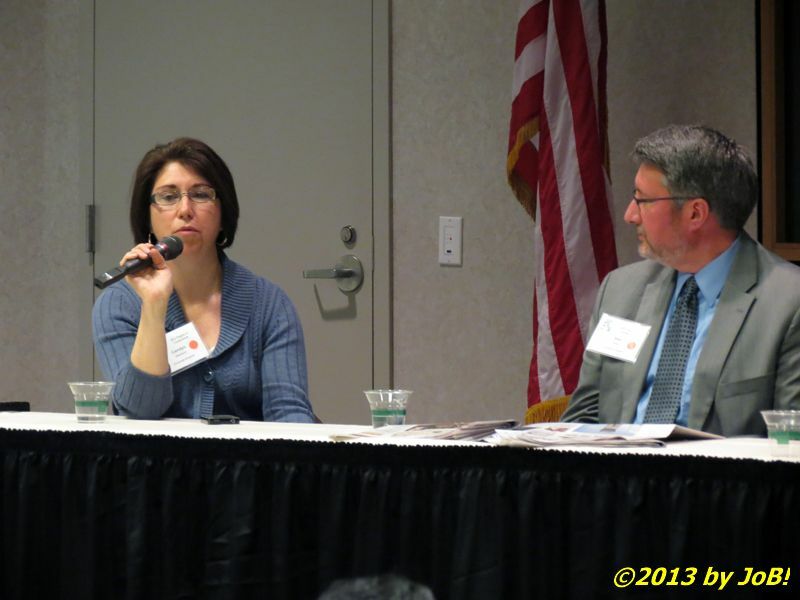 Barry Barber and Mary McCarty, both from The Dayton Daily News, have written a wide variety of stories concerning the local military community in and around Wright-Patterson Air Force Base, the region's major defense installation (and, with over 26,000 military, civilian and contractor personnel assigned, Ohio's largest single site employer). 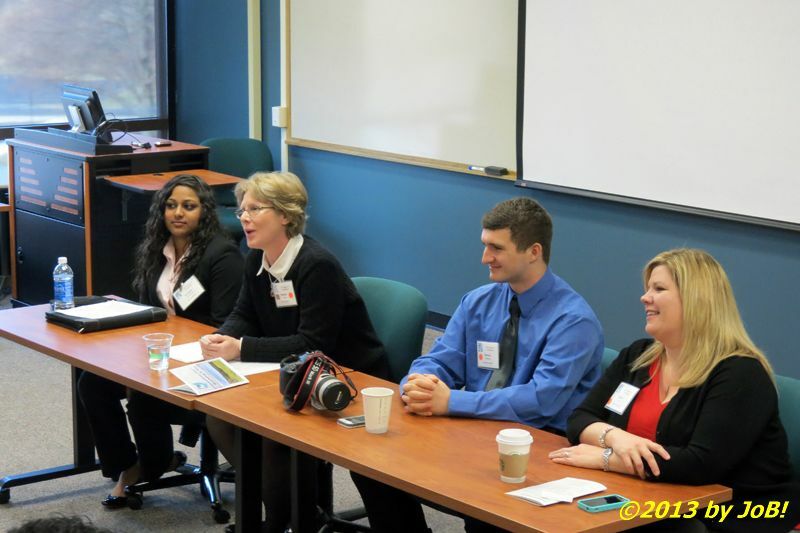 In addition to the two local journalists, the panel also featured Pam Walck, a current doctoral student at Ohio University's E.W. Scripps School of Journalism and former military reporter for The Savannah Morning News. Two senior military officers were also included into this discussion. 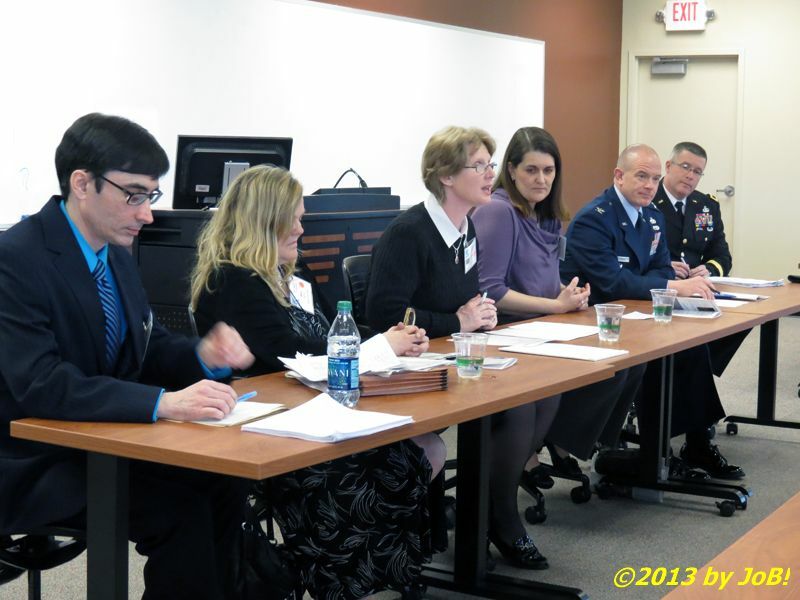 Colonel Daniel M. Semsel, vice commander of the 88th Air Base Wing at Wright-Patterson, and Major General James Hoyer, the adjutant general for the state of West Virginia, provided their command perspective on the role of journalism within the military's mission. Nerissa Young, the moderator for my morning internship session, performed the same role for this group. - Americans serving in uniform (active duty, guard and reserve) currently total only 2.5 million people--less than one percent of the country's total population (that number doubles to nearly 5 million if dependents are included). With that small number being assigned to fewer bases (due to realignments and closures), many in this country do not have direct contact with members of that community on a regular basis so the plight our troops face after 12 years of war and the challenges of reintegration to the civilian world are probably outside of the collective consciousness of the whole. - With Afghanistan surpassing Vietnam back in June 2010 as our nation's longest armed conflict (nearly 11 and a half years had transpired between early October 2001 and that recent Saturday), "war fatigue" has settled in with the general public and producing repetitive stories about deployment and separation have lost their luster among a majority of the media (locales with significant military populations excluded). If this panel had been held a decade earlier (in the wake of the start of the Iraq invasion) or was discussing one of today's "hot button" issues (gun rights, gay marriage), I am willing to bet that there would've been far more than nine people in that room. - With a significant number of Americans wanting some level of military intervention in Syria, North Korea and/or Iran, it is surprising just how many of those supporters have not fully learned the brutal lessons of war from our two most recent martial forays. Many in that group probably could not find even one of those three "hot spots" on a map nor provide any specific background information on the events that have attracted their growing ire against those nations. We have seen on numerous occasions throughout our history just how naïve Americans truly are about issues happening outside their country's borders and that responsibility can be laid directly at the feet of today's entertainment-flavored, for-profit news organizations. Sadly, ratings/circulation and the constant need to attract viewers/listeners/readers have supplanted the public good as the raison d'être for "the Fourth Estate". - While the military members of the panel expressed their desire for the press to tell the military's story, I believe that they want to turn them into extension "public affairs officers" (PAOs) instead of doing the jobs that they are trained to do. The mission of military PAOs is to deliver their unit's message to the local or general public through a wide variety of media outlets (newspapers, radio, television and online) and to serve as liaisons between their respective commands and traditional journalists. As "storytellers", they rarely--if ever--practice investigative journalism inside their own closed communities because such introspection would not be in the best interest of the military (in 2004, The Pentagon Channel debuted on many cable television providers in an attempt to connect directly with the American people and bypass the filters of the "mainstream media"). It is only when the magnitude of negative events supersede internal censorship attempts (like the revelations of torture at Iraq's notorious Abu Ghraib prison back in early 2004 or the more recent sexual misconduct involving trainees at Lackland Air Force Base) that true journalism is conducted and that is normally performed by external reporters. External reporters were embedded with military units during the early days of Operation Iraqi Freedom (OIF) and, due to the relative ease of those operations, positive stories (like that of the rescue of captured Army private Jessica Lynch) seemed to dominate their coverage and almost always painted the military in a very good light. However, when those same journalists wanted to tell stories of not-so-positive events (such as the rising death toll of US soldiers and their return to this country in flag-draped coffins), many pro-war supporters tarred them with "un-American" and "unpatriotic" epithets for simply doing their jobs. - No one seemed to want to address the "800-pound gorilla" in the room--the media's complicity in terms of "selling" that war to the US public. With the 10th anniversary of the start of OIF occurring last month, many outlets have done retrospectives on how that war came about with some actually bringing up the Judith Miller/Michael Gordon aluminum tubes story as being the most egregious example of a political agenda being disguised as reliable intelligence and the media simply echoing what it was being handed instead of doing any investigative work (Knight-Ridder, back before it was bought by McClatchy, was one of the few outlets to actually push back against the White House's narrative). Even the supposed "liberal" MSNBC news channel was guilty of "cheerleading" for the administration (Hardball host Chris Matthews' was caught gushing over President Bush's carrier landing and flight suit promenade on the deck of the USS Abraham Lincoln in May 2003) and actually fired host Phil Donohue for not being more supportive of the war. My last session for the day was another one that intrigued me when I first reviewed the event schedule. Called "What's Your Brand? ", its three-person panel provided personal insights and anecdotes about establishing your unique brand (a combination of reputation, talent and passion) within your news organization as well as your digital image to the outside world. Since I am still mulling over what my specific journalistic path will be (opinionating, photojournalism, lifestyle), the advice given about thoughtfully developing a branding strategy will help me immensely when I do make that decision. All in all, the $40 and 10 hours of my weekend time invested at the SPJ Region 4 Spring Conference was well worth it. This was my first encounter with the group that I originally joined solely in an effort to secure media credentials for my political reporting events last year. Did the conference achieve their advertised objectives? Professional development...check. Industry experts...check. Networking opportunities...double check. With a regional event now under my belt, the next logical step would be attending a national conference but I'm not entirely sure if it will be the one this coming August. I would honestly feel more comfortable if I first completed my studies, then chosen and debuted my brand and finally marketed the heck out of it before rubbing elbows with lifelong journalists at such a venue. I currently rely heavily upon my "journalism or bust" biography when I meet people involved in media but I realize that path will eventually lead me to a "fork" with only two posted destinations--my dream's success or failure. With my continued online absences (and increased demands on my time and resources from my current profession), things aren't looking very good right now for the former. Perhaps getting back into the academic routine next month might help me reapply myself to this blog and to readjust my online activities in accordance with my recently changed work schedule. Looking at the calendar, I have a little over four weeks until the beginning of the first summer session--it's time to put up or shut up!